A cyclo-ergometer exercise test was performed on this 57-year old male patient. He is a smoker with a family background of CAD. He is suffering from left bundle branch block making ST-segment analysis impossible. The patient has achieved 78 % of max. heart rate at 120 watts. Moderate paleness and dyspnoea have been observed at the end of the 120 watts step. 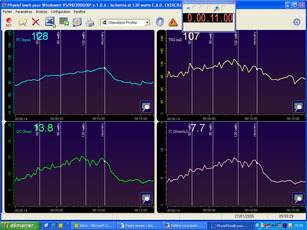 However, after a normal initial increase, the stroke volume dropped dramatically from the beginning of the 120 watts step. Patient was sent to the cath. lab. for coronary angiography that revealed two coronary stenosis.